SHAMROCK COLLAR is one of many collars purchased. Our fur baby is always on trend wearing a festive collar to celebrate the holidays and seasons. Hot Dog collars offers a diverse collection of themes. 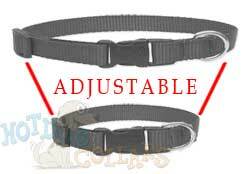 Each collar is well made and colors do not fade at an excellent quality and value. I really loved the items I bought.....collar, leash, and harness in the Shamrock print. I got my dog on St.Pat's Day, and since her name is Shamrock, she had to rock the shamrock gear. I originally ordered everything in large, but a quick, easy return through customer service fixed MY error quickly and I received the corrected order quickly. Unforfunately the snap on her collar broke. I contacted the company and they're sending out a replacement immediately. Overall, excellent customer service and would recommend ordering from this company, as I will use them again. Why use a company with bad customer service? Life's too short !!! good price and received quickly! Very nice St. Patrick's Day collar, nice bright colors, a perfect fit for our small dog. I was looking for a collar for St Patrick's Day for our cat. The x-small size fits her perfectly & the design is great! This is a good site with lots of options. The collar is not made of cheap material and seems to be a good deal in comparison to other sellers. My puppy looks adorable in his shamrock collar! Very happy with the service too!!! Collar was as advertised. Good price, quality and prompt delivery. Reggie looks very handsome with his new collar for St. Patrick's Day! Will definitely return and buy different collars for all the holidays.